An upgraded version of one totally tasty tremolo. Versatile feature set. Sounds rival the best. Expression pedal control. 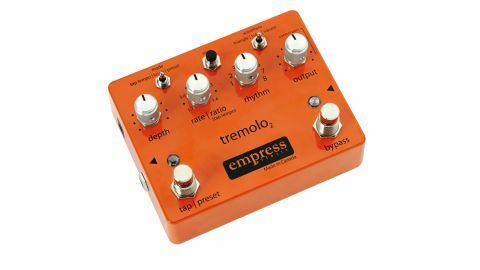 The latest version of the very first Empress pedal, the Tremolo2 offers a choice of three waveforms - a standard triangle with a smooth ramp from loud to soft, a gorgeous asymmetrical throb, as found in a 'brownface' Fender Vibrolux amp and a choppy square wave. "There's also a choice of eight rhythms for the undulations"
There's also a choice of eight rhythms for the undulations. Rhythm 1 on the rotary switch is standard tremolo as we all know it, but the others offer musical variations by putting an accent on, say, every fourth beat - there's even one rhythm in 5/4 time! You can set the tremolo rate with a knob or via a tap tempo footswitch, and there are eight footswitch-recallable memory slots. On top of all this, there's an advanced configuration mode, where you can customise the pedal's functionality and control of parameters by expression pedal, CV, external tap switch or MIDI. As good a trem as we've heard, with an impressively versatile range of facilities.